Football season is pretty popular in my family. 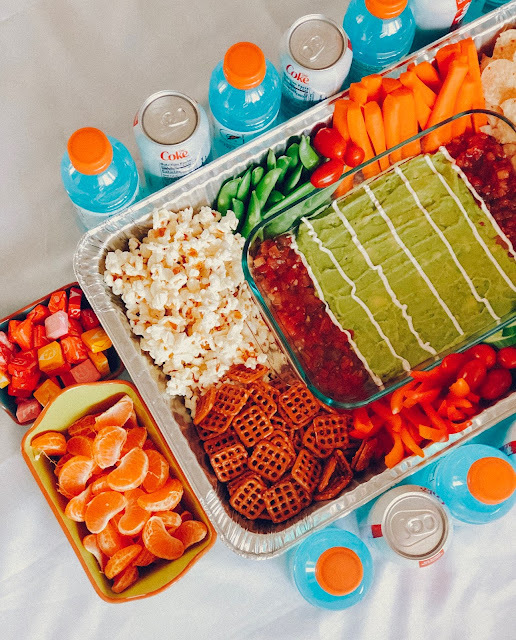 When there’s a big game on TV, there’s sure to be lots of family, friends and food close by. People always coming and going, cheering and yelling, munching and eating. Super Bowl Sundays are full of excitement. The amount of food it takes to feed a house full of football fans can be enormous. I often have countertops and tables filled with soda, pretzels, chips, dips, snacks, finger foods and desserts. This year I decided to put all the snacks together and create a Super Bowl Snack Stadium!! 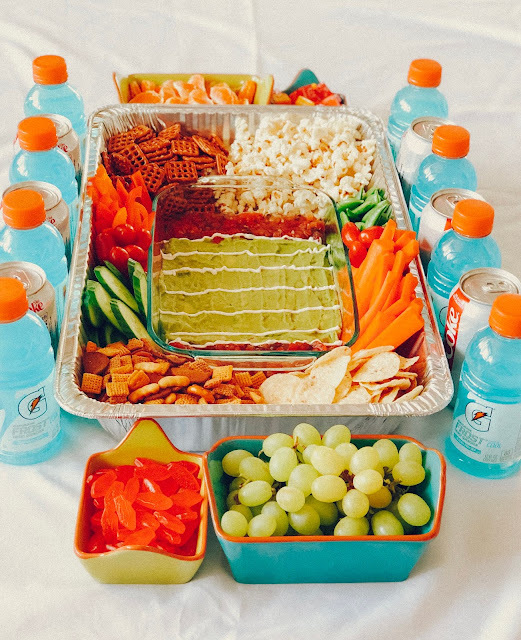 This Super Bowl Snack Stadium is the perfect crowd pleasing snack station! It has everything from a salsa & guacamole football field, fruits and veggies for dipping, to swedish fish and starbursts, and everything in between! There is something for everyone! Plus, this stadium is super easy to make and it comes together in a matter of minutes. Here's what you'll need. 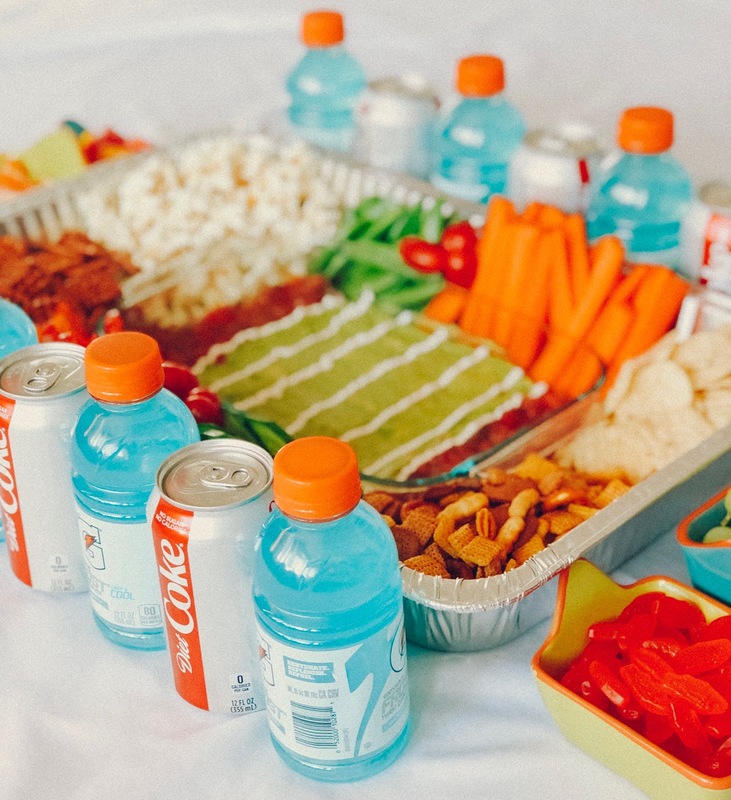 I like to surround my Snack Stadium with a couple of drink options! I chose to put out Diet Coke and Blue Gatorade for this one! It was a hit! You can use whatever drinks you like! You could put little water bottles, sparkling water, Dr Pepper, lemonade etc! 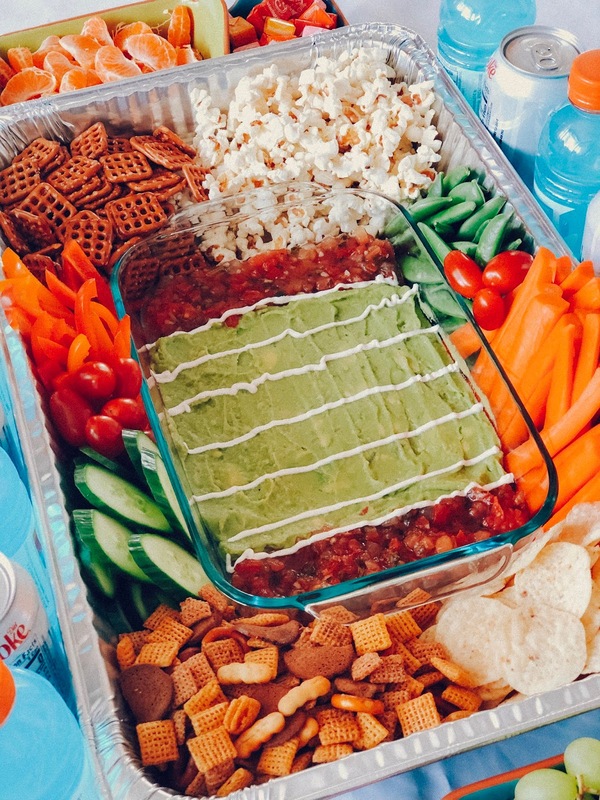 The base of this Snack Stadium is a disposable tin roasting pan. This pan is great because one, you can throw it away when it's empty and two, it's super cheap to find! I bought mine at Smith's! 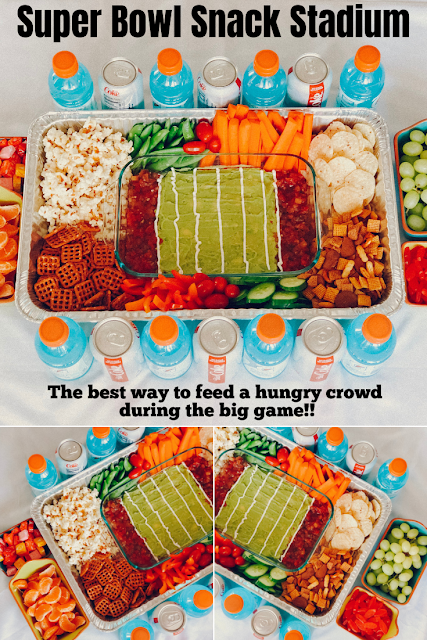 You will also need a smaller pan that will fit inside to make the guacamole football field. The Guacamole Football Field comes together super quick! Simply place the guacamole in the center of the smaller pan, leaving the end zones open. Then, fill the end zones with prepared salsa. Finally, place sour cream in a ziplock baggie and cut off the corner. Pipe yard lines onto the guac. There you have it! An optional step is to add black olives to the field to stand as "players". 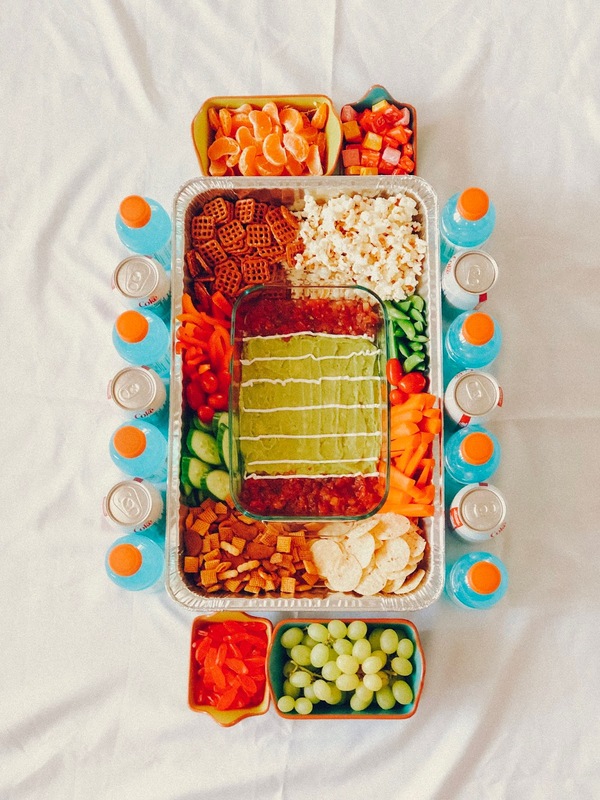 Start by making the Guacamole Football Field. 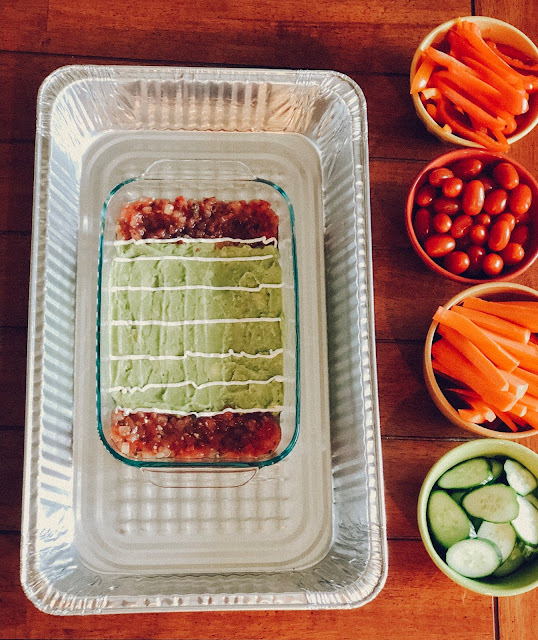 Simply place the guacamole in the center of the smaller pan, leaving the end zones open. 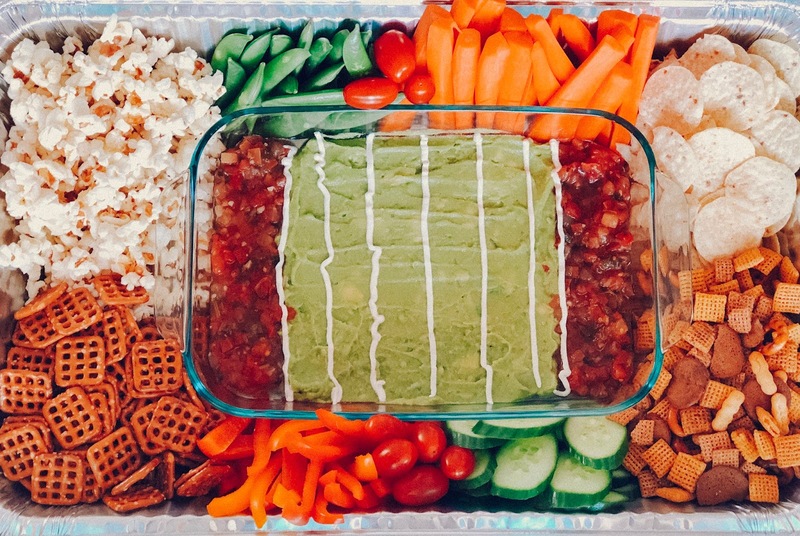 Then, fill the end zones with prepared salsa. Finally, place sour cream in a ziplock baggie and cut off the corner. 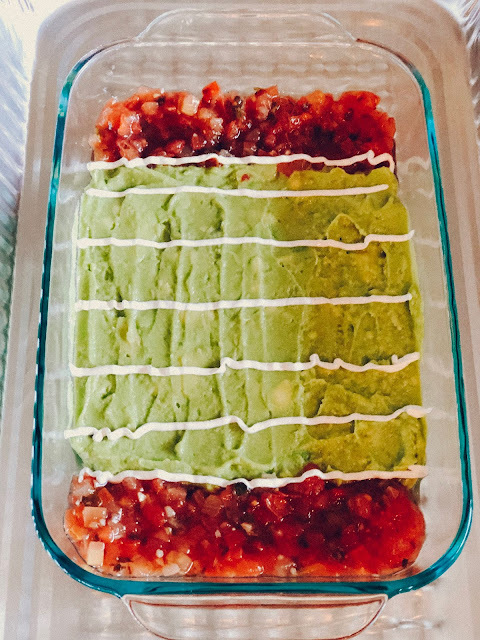 Pipe yard lines onto the guac. 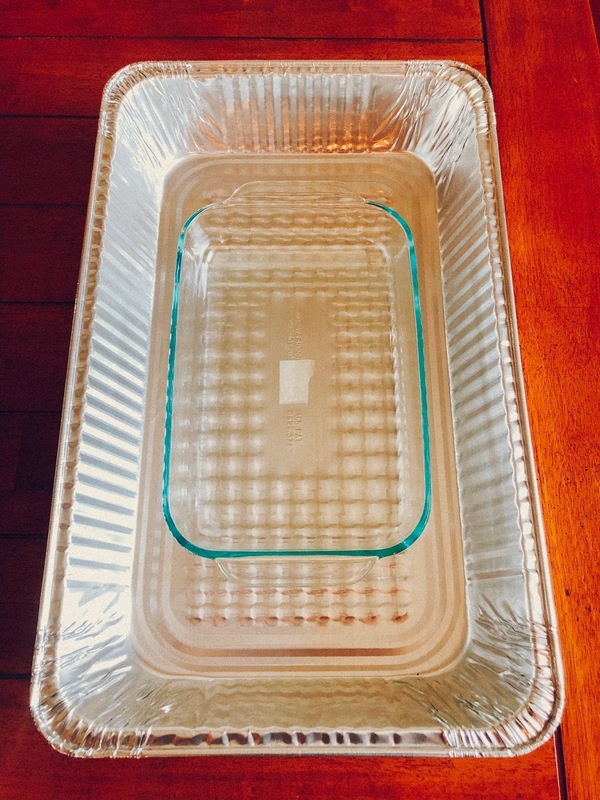 Next, place the football field into a larger, roasting pan. 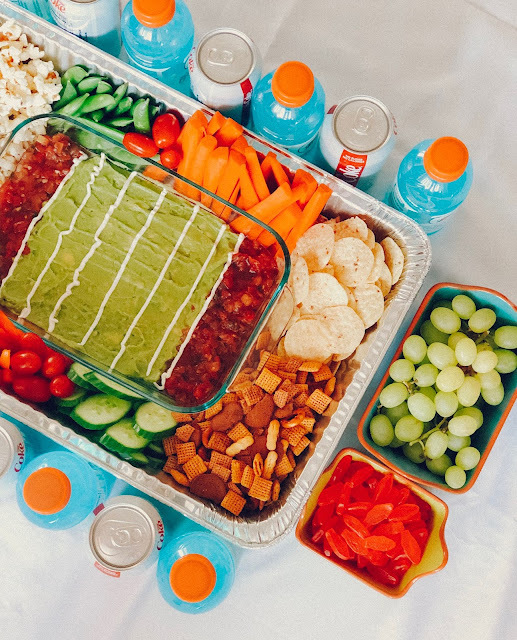 Begin filling the outsides of the pan with veggies, chips, and snacks. 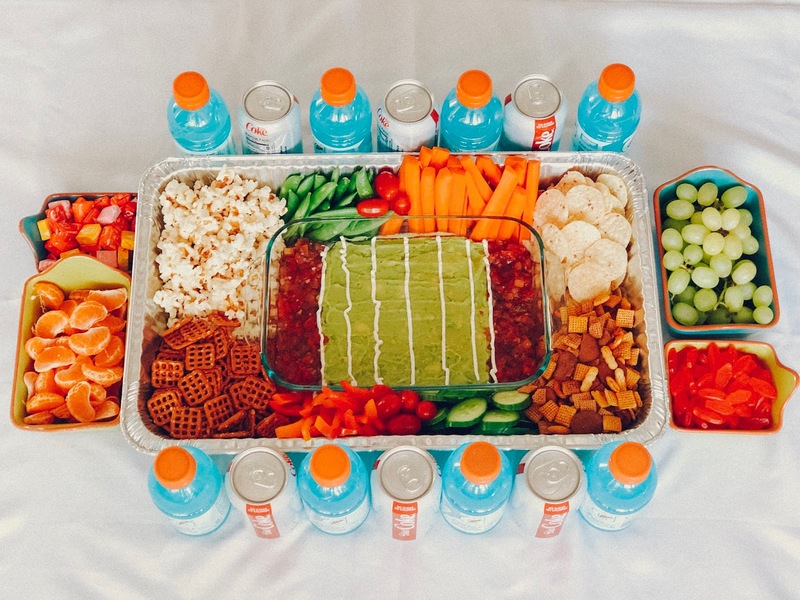 Place 2 additional bowls at each end zone, and fill with candy and fruit. Finally, surround the stadium with drinks of choice. Like this recipe and want to save it for later? Pin it to Pinterest here! !